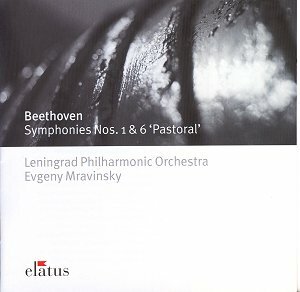 Symphony no.1 in C, op.21, Symphony no.6 in F, op.68 � "Pastoral"
To the best of my knowledge an all-Russian complete Beethoven cycle has never been attempted. The nearest would be the Western-based Paul Kletzki who recorded all the symphonies for Supraphon with the Czech Philharmonic. Mravinsky�s posthumous career on records has burgeoned in a manner similar to Furtwängler�s, with discs appearing from a variety of sources and covering quite a range of repertoire. Here we have late Mravinsky (he was 79 when these performances were recorded and had been conductor of the Leningrad PO for 44 years) in generally vivid sound, I suppose by courtesy of the local radio station. There is a certain rasping quality to the wind as recorded which we used to think of (in the famous Tchaikovsky recordings for DG) as quintessentially Russian, though Mariss Jansons (who ought to know) said it was due to the fact that the players were too poor to afford high-quality instruments. If that is so, they did wonders with them since the actual tonal shading is masterly. This is just as well in the case of the clarinettist in the "Pastoral" since the recording engineer either thought he had been engaged to record a clarinet concerto or else was a blood-relation of the player and determined to preserve his contribution for all time. The player withstands this close scrutiny but it would have been nice to have had Mravinsky�s own balance. Other Mravinsky recordings of these works may or may not exist for better or for worse, but his interpretations can be judged without serious problems. The First Symphony offers a nice balance between Beethovenian ebullience and Mozartian grace. It is notable for a complete clutch of repeats (including the first repeat of the Scherzo in its return after the Trio), a swift minuet-like tempo for the second movement (which Beethoven asked for) and a rather steady third movement (which he didn�t but which permits the Trio to follow without any slackening of the pulse). It is odd that the "Pastoral" is shorn of its first movement repeat, given Mravinsky�s scrupulousness in the First Symphony, but the performance is well worth hearing. The conductor�s fanatical insistence on innumerable rehearsals of standard repertoire pieces pays dividends in his control over the crescendos and diminuendos in the first movement which is unhurried but forward-flowing and very fresh. The second movement is kept on the move, not as fast as Weingartner�s but not far off Beethoven�s own marking, and Mravinsky�s dynamic shading makes for exceptional formal clarity. The Scherzo is swift and buoyant with the tempo whipped up for the "contredanse" sections; a contrast which Beethoven asked for but which Weingartner for some reason levelled out. The Storm is fast and thrilling, with the conductor�s superb control over dynamic shading ensuring that every detail is clear. After a very poetical lead into the Finale, Mravinsky�s shaping of the string melody is quite wonderful, simple yet with the infinitely subtle shading we more often associate with single performers than entire orchestras. I wonder how much rehearsal time went into this. At a tempo close to Beethoven�s own, Mravinsky finds breadth, warmth and also great vitality in this movement, which therefore crowns a performance which belongs high in the work�s discography. The information comes from a Mravinsky discography and refers to performances that have actually been issued at one time or another (Elatus have also released a coupling of the most recent versions of 5 and 7, reviewed for the site by John Phillips). Is there more to discover? Mravinsky programmed the 8th Symphony at least twice in 1942/3 while the orchestra was exiled in Siberia (for safe keeping during the war years, not to work the salt mines!). During this period they gave 538 concerts, over 200 for the radio. Does any of this survive? And did he ever conduct no.9, or was Schiller�s text too subversive for the Soviet authorities?